How to extinguish a fire without using water? If we face a fire our first impulse is to search for water to extinguish it. However, there are situations where water can cause more damage than fire. For example, if we have a room full of computers, using water would cause a short circuit. In all these combustion reactions, oxygen is always necessary. Covering a candle with a glass can extinguish the flame because it will finish with all the oxygen that was inside the glass. Then, how can we extinguish a fire without water? 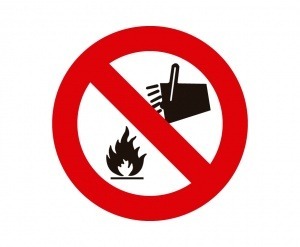 – The simplest way is to avoid the contact to avoid that the oxygen feeds the fire, is to cover it completely to avoid the contact with the air. – Even so, the most popular strategy of small-scale are fire extinguishers. They expel two chemical compounds that when reacting with each other produce water. The old extinguishers, called ABC, do not contain water but they work with a mixture of different chemical compounds able to catch the oxygen of the air extinguishing the fire, but this chemical mixture is really corrosive and can cause injuries to people. Only newer fire extinguishers use something much less harmful. These extinguishers contain carbon dioxide, which is CO2 which is kept in the solid state due to the strong pressure inside the fire extinguisher. When opening the extinguisher it create a cloud of CO2 above the fire, displacing the oxygen and preventing its growth. – In rooms with a large number of computers and technology there is another method of fire suppression that replaces water sprinklers: argon gas, a noble gas that does not react chemically with anything and is heavier than oxygen, The argon cloud goes to the back of the room and displaces oxygen. They move the oxygen to extinguish the fire, so if you are in a warehouse of computers and expel argon gas in the fire, you will not be able to breathe. – 3M laboratories in the United States have recently developed a chemical called Novec 3M that acts as the water in a fire extinguisher but evaporates fifty times faster. Spreading this liquid with the sprinklers would put out a fire and leave everything dry in two minutes, without damaging the technology or affecting the oxygen in the air.